Here at the ranch, if we sell it — we believe in it — and use it! So we always have the bulk feeds in stock for our local customers to pick up. If you are not in the Sonoita area and are interested in using the best holistic feeds for your animals – pick up the phone and call the ranch. We are happy to help set you up with bulk purchase accounts for your animals! Click on the product name for complete description and pricing. PGR is a clean, high-quality grain ration consisting of tested-chemical-free oats, corn, barley, Dynamite Plus™ V/M, and Dynamite HES — an additional pellet containing non-GMO whole extruded soybeans. Cool Stance copra is made from the white part of the coconut, which has been dried, baked and ground. Totally natural and GMO free. 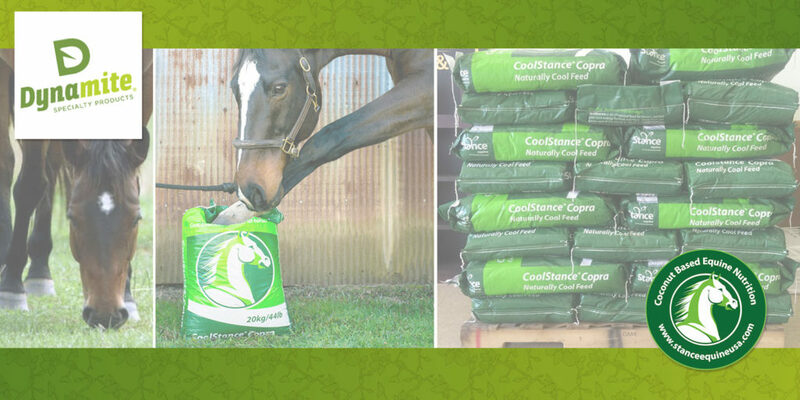 Cool Stance copra is a unique horse feed low in Non Structural Carbohydrate (NSC) and high in digestible energy content. Cool Stance is packed with ‘cool’ energy from coconut oil and fiber from coconut meal. Cool Stance copra is suitable for most horses and can be fed to maintain a natural state of gut health and insulin sensitivity, i.e. normal insulin metabolism. A superior high-digestibility kibble made with fresh, hand-trimmed USDA chicken and Turkey. Contains the famous Dynamite V/M supplements as well as prebiotics and probiotics to aid digestion.